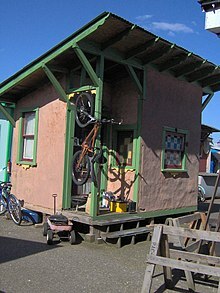 Dignity Village is a city-recognized[clarification needed] encampment of an estimated 60 homeless people in Portland, Oregon, United States. 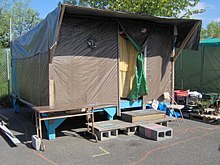 In the days before Christmas of 2000, a group of transients in Portland established a tent city which attracted attention, both opposition and support, which eventually evolved from a group of self-described "outsiders" who started unlawfully occupying a city owned land to a self-regulating, city-recognized "campground" as defined by Portland city code. 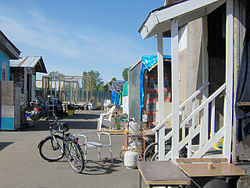 The encampment is currently located on a land near Portland International Airport elected community officials and crude but functional cooking, social, electric, and sanitary facilities, Dignity Village got its start as a collection of tents and campers "squatting" illegally on unused public land near Downtown Portland. 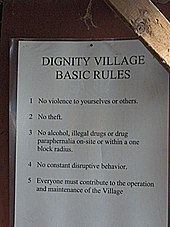 Dignity village was founded by eight men and women who pitched five tents on a public land. Repeated attempts to shut down the campsite[POV? – discuss]  have been rebuffed by the Portland City Council, which has guaranteed the community's existence through at least 2010. Because past criminal convictions are not a negative criterion for membership, and because of dangers presented by continuing construction, children are not allowed to reside in the community. Membership size varies and is limited by the physical size of the available space at the city yard site. As of January 28, 2016, approximately 60 residents made their home at Dignity Village. Designated by the Portland City Council as a transitional housing campground, Dignity Village falls under specific State of Oregon building codes governing campgrounds. This provides a legal zoning status. Lack of building codes has shut down many other shanty town/tent cities in the past. Housing in the Dignity Village community previously consisted of tents, hogans, teepees, light wooden shacks, or more substantial structures built using principles of ecofriendly green construction such as strawbale walls and recycled wood. Light clay straw housing was also built in 2003 as part of the City Repair Project's Village Building Convergence. ^ Busse, Phil (October 9, 2003). "Staying Put--Again: Dignity Village Holds Out and On to Their Homes". Portland Mercury. Retrieved February 16, 2012. ^ "Tiny home destroyed in propane explosion at Dignity Village in NE Portland". www.msn.com. Retrieved 2019-04-14. ^ Burris, Emily , KOIN 6 News (2019-03-06). "Explosion at Dignity Village injures 1". KOIN. Retrieved 2019-04-14. ^ Bayer, Israel (October 13, 2003). "From Doorways to Dignity". Street Roots, via Street News Service. Archived from the original on September 30, 2007. ^ "Mayor Charlie Hales | The City of Portland, Oregon". portlandonline.com. Retrieved July 27, 2016. ^ a b Sabatier, Julie (January 11, 2006). "Laura Brown: Life in Dignity Village through the eyes of one longtime resident". Willamette Week. Archived from the original on October 10, 2007. Retrieved February 16, 2012. ^ Campbell, Duncan (October 23, 2003). "America's homeless become new small-town pioneers". The Guardian. Retrieved February 16, 2012. 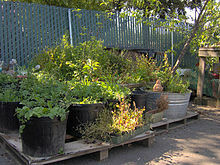 ^ "DailyGood: Dignity Village: Homes For Portland's Homeless". dailygood.org. Retrieved July 27, 2016. ^ "Projects". City Repair. Retrieved April 7, 2009. ^ "Dignity Village Builds Straw Bale Housing Prototype". New Connexion. May–June 2003. Archived from the original on November 21, 2007. Retrieved April 7, 2009.